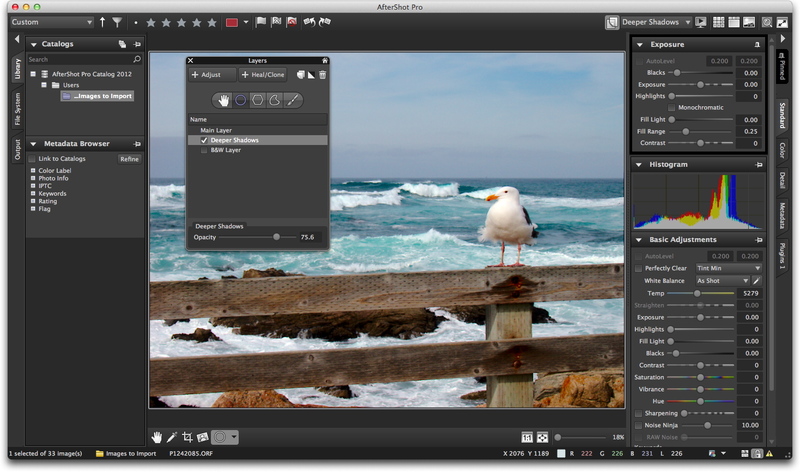 I was impressed with Corel's ambition in its 1.0 release of AfterShot Pro. And for the most part, the execution wasn't bad either. I provide a complete rundown of my impressions in the Macworld Magazine review, Corel AfterShot Pro photo manager plays well in the big leagues. Since the review, I've been using AfterShot for quick turnaround jobs. It won't replace Lightroom or Aperture (at least not yet). But it has taken over the jobs I used to use Adobe Camera Raw and Bridge for. You might want to try the 30-day free trial. Full price is $99. But Corel does offer the "competitive upgrade" deal for $79. I found it to upload images fairly fast. Like the idea that you can have multiple catalogs and selective editing. Just like you I found the layering good as you did not have to do any round tripping. However I did not care for the printing. Been having some issues with that feature. Like setting printer profiles and print sizes. But overall it it is not a bad program. And for 79.00 if you own Aperture and or Lightroom it would not be a bad program to have. I also agree as you do that it will not take the place of Lightroom and or Aperture.